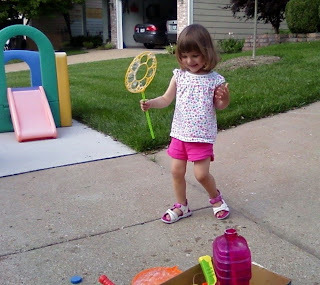 Last Monday, when it wasn't raining, we had some fun time outside in front of the house. Mom and I sat and relaxed while Alyce enjoyed some time with her bubbles. I'm sure Alyce has gotten the bubbles out before now but this is the first time in a long time I've been around to witness her joy with them. We have all type of different bubble making devices. We have little single bubble makers, bubble guns that stream out tons of bubbles, a wand that makes one really big bubble, and Alyce's favorite is a big wand with lots of bubble holes in it. Alyce likes this wand because it provides the most instant gratification. She can dip it in a big plate full of bubbles, swing her arm around, and bubbles go everywhere. At times her wand positioning can be a bit off which means little to no bubbles comes out. Also she can get a little over excited and swing the wand around like a baseball bat. My favorite thing about Alyce blowing her own bubbles is that every time she makes some she says "Big Bubbles!". It could be one teeny bubble or a hundred large bubbles and she would say "Big Bubbles" every time. When Alyce played on Monday the wind was gently blowing in all directions which gave Alyce a lot of opportunities to chase down some bubbles. Her chasing them is a new development since last fall she hadn't mastered running. Now that running is old hat she zoomed into both neighbor's yard in pursuit of her soapy quarry. Alyce chased the bubbles we made for her for so long she got red cheeked and overheated.